"Four countries in 4-days strengthening our footprint in Gulf and West Asia! PM @narendramodi begins Day 4 with business - Oman-India Business Meet in Muscat. Pitching India as an attractive destination to do business, complementing our expanding strategic partnership," External Affairs Ministry Spokesperson Raveesh Kumar tweeted. PM Narendra Modi arrived in Muscat on Sunday from Dubai. 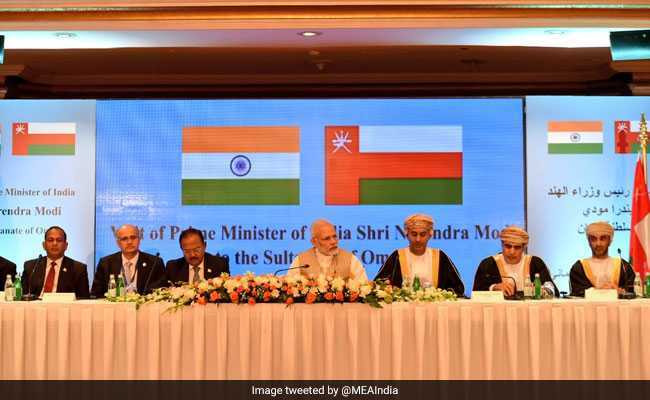 Muscat: Prime Minister Narendra Modi today met with industry leaders of the Gulf and West Asia region at the India-Oman business meeting in Muscat during which he pitched India as an attractive destination to do business. PM Modi, who arrived in Muscat on Sunday from Dubai on the last leg of his three-nation visit, also met Deputy Prime Minister for International Relations and Cooperation Affairs of Oman, Sayyid Asa'ad bin Tariq Al Said. The two leaders discussed intensification of bilateral cooperation in areas of mutual interest, External Affairs Ministry Spokesperson Raveesh Kumar tweeted. "Four countries in 4-days strengthening our footprint in Gulf and West Asia! PM @narendramodi begins Day 4 with business - Oman-India Business Meet in Muscat. Pitching India as an attractive destination to do business, complementing our expanding strategic partnership," Mr Kumar said. Later, the prime minister will visit the historic Shiva Temple of Muscat. The temple is one of the oldest of the region and is located in the Matrah area near Sultan s Palace. The temple was constructed 125 years back by Merchant Community from Gujarat and was subsequently renovated in 1999. The temple has three deities - Shri Adi Motishwar Mahadev, Shri Motishwar Mahadev and Shri Hanumanji. During auspicious days more than 15,000 devotees visit the temple for prayers. He will also visit Sultan Qaboos Grand Mosque before heading back to Delhi.